As part of a national 30-city promotional tour crisscrossing the United States, West Virginia Public Broadcasting will present a special screening of the upcoming PBS documentary, "Country Music: A Film by Ken Burns," on Tuesday, April 16, at 7:30 p.m., at the Lyell B. Clay Concert Theatre in the Creative Arts Center at West Virginia University in Morgantown. The film’s writer and producer, Dayton Duncan, and producer Julie Dunfey, will showcase an exclusive selection of excerpts from the film specific to the Mountain State’s rich country music heritage. Beloved West Virginia country music artists Kathy Mattea and Charlie McCoy, both of whom are featured in the documentary, will perform live with the Mountain Stage Band. Tickets are available at wvpublic.org/countrymusic. All tickets are general admission and available for $13 plus applicable fees. Doors will open at 7 p.m. and early arrivals will be treated to a performance by the WVU Bluegrass and Old Time Band in the lobby prior to the show. Was country music an interest of yours? How did this project get started? What prompted this idea? We're always looking for good stories in American history. And now in retrospect, having spent the last eight years of my life immersed in the story of country music, I can't imagine a better story in American history to tell than this one. It's complex. It's very emotional. It proves some of the things that I think our country is so beset with now: we're into making distinctions about the "other" and forgetting that we're all kind of in the same boat together. Country music is the music of people who felt that their stories haven't been told. And so it's been our privilege to tell those stories and to tell them in an interconnected way. And to also show that there are are no real borders between the various musical genres, and that country music isn't one thing and never has been one thing. Eight years is a long time. Can you just give us a little bit of insight into what that process is like? This is what we do. And it involves deep dives; it takes a lot of time. I mean, the only place this could be done is in public broadcasting and PBS because of the amount of time required. It's usually labor intensive. We spent a long time researching for that rare photograph that has never been seen, for that rare home movie or newsreel footage that has never been seen before, not because we get to advertise that, but because it fits into a complex story that we're trying to tell. And so that takes time. Then the story itself is a huge sort of complex, multi-generation novel with dozens of dozens of characters whose stories have to be intertwined, whose values have to be calibrated and just the right way. So, it's nothing that you can just sort of churn out. When the script comes, we spend two or three times just looking at it as a document and allowing scholars to comment. We had a wonderful advisory board, including Kathy Mattea. And then after three or four drafts at that, making the writing better, then I read it as the narrator. We sort of listened to it as a radio play, if you will. We do what call that a "blind assembly." We do two of those and we make huge, substantial, significant changes -- cutting it down and cutting it down. Art is always about subtraction. So we have, you're talking to me in New Hampshire, and we make maple syrup here and it takes 40 gallons of sap to make one gallon of maple syrup. So we have a 16 and a half hour film. So if you multiply that times 40 or 50, you understand all the "negative space" of creation, if you will, what's not in the film. The 100,000 photographs that we looked at, the 175 hours of interviews to have maybe the existing four or five that are in the final 16 hours. But you can't do a good job that will last and be able to be used in classrooms and to be a favorite on PBS unless you've done that kind of deep dive. It isn't just sort of regurgitating and repeating superficial conventional wisdoms, as we do in our contemporary political discussions, it's more nuanced. "...how many times I have just felt like the story we're telling performed on me a kind of open heart surgery..."
You've made so many of these epic films. What is it about this one about country music that you're going to remember in years to come? The country songwriter Harlan Howard said the country music is "three chords and the truth." That means it's very simple, elemental music. Anybody can sort of master those records. It lacks the sophistication and elegance of classical music or jazz. But it also lacks its complexity and difficulty to understand and find relationship to. And the truth that is telling in those simple chords is the elemental stuff of life that everybody — even if they're not a country music fan (which we hope to convert) — these are the things that we all feel. The the joy of birth, the sadness of death, falling in love, trying to stay in love, losing love, loneliness, redemption — this is all stuff that happens to everybody. And somewhere there is a country song that exactly fits who you are at that moment. We just want to parade the best of that tradition out and say listen to the mastery of of Hank Williams who says "I'm so lonesome I can cry." It just seems so elemental. Or Dolly Parton — a chorus of her most celebrated song goes, "I will always love you, I will always love you, I will always love you." But when you hear that song, when you hear her remarkable voice, and when you hear the circumstances of why she wrote that, which is what we do as storytellers is add dimension and complexity and undertow to this to the narrative, it has more meaning. And so I think for me over the eight years, the most surprising thing is how many times I have just felt like the story we're telling performed on me, a kind of open heart surgery and expose me too powerful, powerful art. I mean, Hank Williams was called the "Hillbilly Shakespeare" and Merle Haggard was called the "poet of the common man." We dissect not just the history of the music and this types and the big stars, but songs themselves that travel unchanged through time and songs that morph into something else. And also, what the act of songwriting is about whether it's Kris Kristofferson, or Dolly Parton (one of the greatest ever), or Merle Haggard or Johnny Cash, or the early pioneers, Jimmie Rodgers, the Carter Family and Hank Williams. So, it's a thrilling ride and so completely, as older films are, utterly American. I understand that you have some roots in West Virginia? My great grandfather was from Pocahontas County, from Hillsboro. And my mother was from Clarksburg. She was a Smith and she married and moved to Chicago. So I've got aunts and uncles who retired to Lewisburg, next door to Pocahontas County. I've got West Virginia in my blood. Most of my dad's people come from just over across the border from Pocahontas in Bath County, Virginia. There's a Burnsville there. So you're talking to a native son in a way. In West Virginia, in Appalachia, storytelling is so much a part of who we are. Do you reflect on that often? Do you ever think about that? Well, that's this is what our first episode is about. You have this centuries-old tradition, millennia-old tradition, people talking to one another, by sitting on the front porch or hearing the music coming across the holler from somebody else's house. And radio then helps spread that and mechanical reproduction helps be you to be able to purchase and understand what that music means. Dolly says it really well in our film: it's carrying the news. And it's not just the news at the moment is the news across generations. So she's talking about songs like the Mule Skinner Blues. 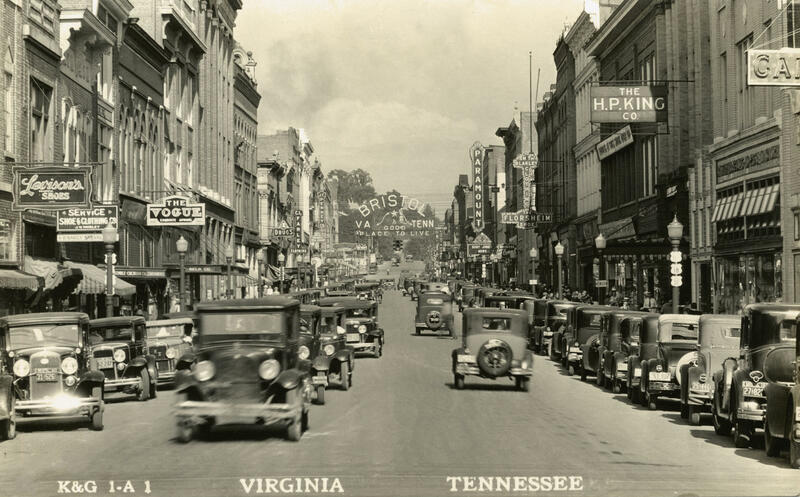 In our film this song is sung first by its composer, Jimmie Rodgers, and then later by the Maddox, Brothers and Rose, and then in his debut at the Grand Ole Opry, Bill Monroe, the father of bluegrass plays it. And then later on Dolly plays it. You just see this family heirloom being passed from generation to generation to generation. 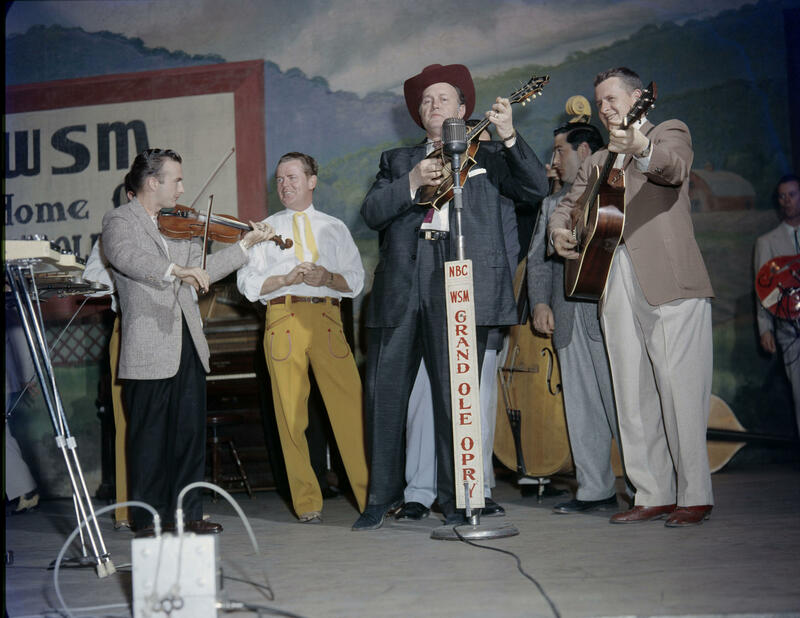 Bill Monroe on the Grand Ole Opry, Nashville, c.1958. So we're looking at the at this wonderful, incredibly complex and interrelated [subject] and at a time when everybody wants to say, "No, I'm different from you, I vote for this party, you vote for that party." You begin to see the ways in which we're all the same, that 99.99 percent of our genetic makeup is the same, and that the same percentage wants the same things for the kids, and their posterity, and for their country. And so this is a way to continue stomping your foot on the front porch, and suddenly realizing that stranger knows the same song as you and that makes them less of a stranger. That's the whole purpose of art: communication and the transfer of emotion. It's the purpose of music, which is as Wynton Marsalis says the "art of the invisible," the only art form that's invisible, and the fastest art form. It works on us so quickly, that we're hoping that the addition of country music helps us return to a much more open kind of conversation and civil discourse that permits us to remember that an alloy is always stronger than its constituent metals. And then if we just returned back to that kind of pure form of us, against them, we've lost the real of us, which is the civilized meaning of us, which is all of us together. That's what country does. 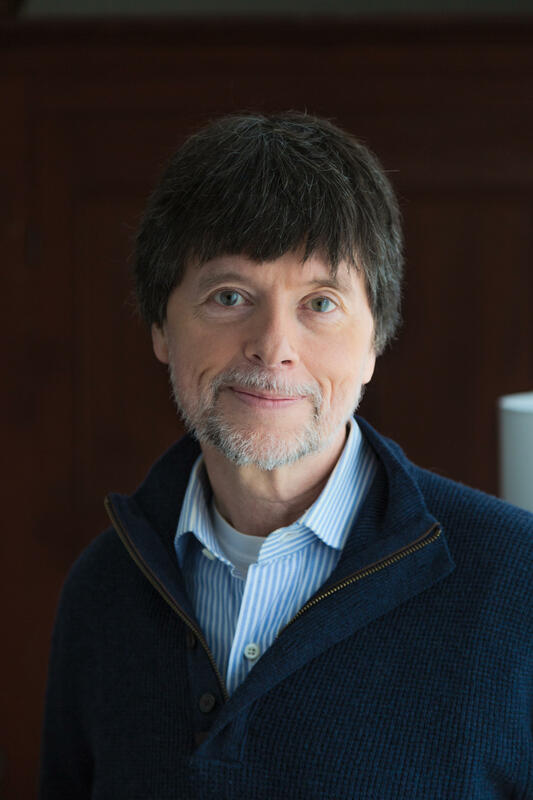 Ken Burns has been making documentary films for over 40 years. Since the Academy Award-nominated Brooklyn Bridge in 1981, Ken has gone on to direct and produce some of the most acclaimed historical documentaries ever made, including The Civil War; Baseball; Jazz; The Statue of Liberty; Huey Long; Lewis & Clark: The Journey of the Corps of Discovery; Frank Lloyd Wright; Mark Twain; Unforgivable Blackness: The Rise and Fall of Jack Johnson; The War; The National Parks: America’s Best Idea; The Roosevelts: An Intimate History; Jackie Robinson; Defying the Nazis: The Sharps’ War; The Vietnam War and, most recently, The Mayo Clinic: Faith - Hope - Science. Ken’s films have been honored with dozens of major awards, including 15 Emmy Awards, two Grammy Awards and two Oscar nominations; and in September of 2008, at the News & Documentary Emmy Awards, Ken was honored by the Academy of Television Arts & Sciences with a Lifetime Achievement Award.